Work is now underway for the extension to Mellor School that will include a new classroom and will enlarge the Hall. This was made possible by a £530,000 grant from the central education fund. The school has launched an appeal to find the additional £25,000 required. The school is obviously an essential part of our community and any offers of support by donation or fund raising will be greatly appreciated. The last few copies of this book of local photographs that capture the spirit of Mellor are available. Sold in aid of the Mellor Church Rose Queen Charity. An ideal present to post to family and friends no longer in the village. This is an active group linked to the Mellor Society. A village sign and notice board are recent additions to the Mill Brow street scene. Successful campaigning has resulted in work to alleviate flooding problems on the road through Mill Brow. A History Group is being established and the membership is looking for interested parties, contributions etc. Planning for a 70th Anniversary of VE Day is underway. Please visit the Friends of Mill Brow website. This is a list of some of the events happening in the village over the Festive period. The Advent Carol Service is on Sunday 30th November. The Festival of Nine Lessons and Carols is on Sunday 21st December. The Crib Services are on Wednesday 24th December at 4pm and 5.30pm. Christmas Eve – Twas’ the Night Before Christmas. A warm Oak welcome throughout the festive period. – raising funds for the upkeep of our valuable community centre. A 3-course dinner and entertainment. The committee have been sourcing genuine South American recipes and enjoying tasting some of them. We hope you’ll agree they are delicious. And we have two of Manchester’s best South-American dancers for your entertainment after the meal. Priority booking for Friends opened on Monday October 6th, public booking on Monday October 13th. As a ‘Friend’ you receive priority booking for our events, a regular newsletter and the satisfaction of helping a very worthwhile community cause. To become a Friend contact our membership secretary Chris Walters on 0161 430 6714 or chris.walters60@ntlworld.com. Your support will be very much appreciated. This small group of Mellor Society members is still meeting throughout the year to work in partnership with SMBC to maintain and improve the Mellor Memorial Park. The results of their hard work will be to the forefront at the Remembrance Day Service and our thanks are expressed on behalf of the society membership. Volunteers are always needed so if you feel that you can lend a hand please contact any committee member for details. To report suspicious behaviour or non-urgent crime call 101, always dial 999 in an emergency. Alternatively, information can be reported anonymously to Crimestoppers on 0800 555 111. Mellor Society Committee members recently attended a meeting arranged by the pub owners to announce the impending closure of the Moorfield Arms and explain the reasons and future intentions. The pub has suffered a dramatic loss of trade over several years and is incurring substantial losses. Due to its relatively remote location and changing social trends its continuation as a pub is not viable. The owners have therefore been considering its future. They believe that the only likely viable use is for residential purposes. The pub has not been marketed as the local evidence strongly suggests there is unlikely to be any realistic interest. The buildings could be put to a variety of uses such as retail and offices without planning permission, but these are also not considered to be viable. Initial informal enquiries with the Council about conversion to residential use, which is considered by the owners to be the only viable use, have been cautiously encouraged. A team has now been assembled to put together all the information to make a planning application. A variety of survey work is being/has been undertaken including site topography, building structure, landscape character, environmental/contamination, and history. The building is not listed, but has significant history, which is being researched and any information about its past would be welcomed. The next stage is to generate development options to consider the optimum form of conversion. The extent of alterations and additions will be constrained by the green belt location, although there is an opportunity to improve the appearance of the building by removing some of the less appropriate additions and by reducing the large tar macadam car park and providing landscaping. This may allow some flexibility to create replacement buildings to complement the historic structure. The proposal will raise various planning considerations including greenbelt policy, which will require very special circumstances to be demonstrated, as well as show that there is unlikely to be any impact on openness. In addition, the site is in an area of special landscape value. Other issues to be addressed include accessibility, viability, sustainability, historic value and site access. It was pointed out that although the Council has a housing land shortage, the greenbelt designation prevents the site being considered appropriate for housing development. An assurance was given that there is no intention to apply for a small housing estate and the development will be related to the existing buildings. The Mellor Community Choir is now up to it’s full complement and is registered to participate in “The Festival of Brass and Voices” at the Royal Albert Hall. This event, to be held on 14th November 2015, is to raise money for Cancer Research UK and will involve over 50 choirs and two of the UK’s best brass bands. Rehersals are underway and the choir will be performing in support of the Mellor Parish Centre during the forthcoming months. Whilst the visible excavation work at Mellor Mill has carried on over the summer there has been a flurry of activity behind the scenes. July 28th saw the Heritage Lottery Fund finally give us the official “Permission to Start”. That means that from that date the project can begin to draw funding down from the grant awarded in September 2013. During the last couple of months the steering group for the project have made a number of key appointments. Fiona Turpin was appointed as the Project Officer and has been busy setting up systems to ensure the next three years of the project run smoothly. Pamela Pearson has been appointed as Learning and Interpretation Officer. Pamela will be looking at how the project can be taken out to a much wider audience through a variety of ways and be responsible for the recruitment of volunteers across the project. On the ground, TAMAS has been appointed as contractors to provide the part time roles of Mill Site Director and the Archaeology Officer. Bob Humphrey-Taylor and Rachel Miller will be providing the hands on management of the excavations and creation of a Small Country Park in an Industrial Heritage setting at the Mellor Mill site. 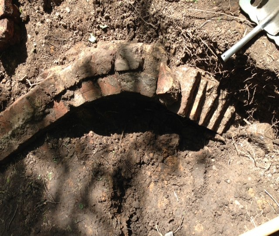 To oversee archaeological matters, across the project, CfAA (The Centre for Applied Archaeology) from Salford University have been appointed as the archaeological contractors. They will be responsible for running a number of community digs at the Mellor Mill and Lime Kiln sites, providing archaeological advice and training, processing archaeological information and writing academic reports. Paul Hartley, Professional Support and Conservation Manager at Stockport Council Planning Services, has recently accepted the role of Chair to the Project Steering Group. An important element of the project is the work that will be carried out by The Canal and River Trust at the Marple Aquaduct and other parts of the canal in Marple. Planning for these important works is now at an advanced stage.The contractors will be offering an opportunity for the public to view the proposed works at a date to be notified. On the 16th November Mellor Archaeological Trust are pleased to announce there is to be a Samuel Oldknow Concert of music from his time. The concert is to be at the Mellor Parish Centre. Tickets are available from Ann Hearle Tel: 0161 427 1149 or from the Parish Centre. The evening will be presented by two talented musicians Rosa Hartley, violin, from Royal College College of Music in London and Hayley Parkes, piano, from Royal Northern College of Music in Manchester. On 30th November there will be a Canal Open Day based around Lock Number 2. At the Open Day there will be information and updates about the Oldknow Legacy project, an opportunity to explore inside a lock (it will be emptied of water!) along with other fact and fun activities. We understand that, weather permitting, “Samuel Oldknow” will also be attending the event. The Minutes of The Mellor Society Annual General Meeting on 27th March 2014 at Mellor Primary School. Mr & Mrs Edleston, I Heaps, D Cole, Mr & Mrs Hearle, Mr & Mrs Watt. Bob Humphrey-Taylor (Chair.) welcomed those present to the meeting and after covering Health and Safety issues explained the revised format of the evening. In order to boost attendance at this years AGM the committee had decided that rather than have a guest speaker we should incorporate a “Great Mellor Quiz”. The formal business of the Society is to be dealt with first and after some refreshments the remainder of the evening will to be devoted to the quiz. Bob reminded those present that only Society members could vote on any issues and copies of the accounts were available in the room from A Stevens (Hon Treasurer). Voting will be on a show of hands either for, against or recording objections. These had been published in Summer 2013 Newsletter 59, were proposed and seconded as correct by I Morgan and A Lee and accepted by those members present. I Davies (Hon Secretary) delivered the following report. The purpose of the Society is to protect and conserve the amenity of our village and it’s business is administered by an elected committee supported by a team of news letter deliverers and subscription collectors. The activities of the committee and items of local interest have been reported in our thrice yearly newsletter and website and if anyone wishes to submit items for publication please contact any committee member. Our Society is its membership who can contact their committee via their published addresses, our website or the AGM. Also, if anyone has any comments or questions regarding the business of the Society and it’s committee please speak to us during the evening. Committee member A Lee has now resigned and Ted Stockton has relinquished his role hosting our website. M Davies has taken on the website hosting and is currently refreshing our website. We express our thanks to the above for their support. It was stated that the subscriptions are to remain at £1 per adult. Our membership of 1185 includes most of the adult residents in the villages of Mellor and Mill Brow. A Stevens (Hon Treasurer) had distributed copies of the accounts at the meeting and was available to answer any questions related to such for recording in the minutes. Though these accounts were qualified T Lowe and P Forbes proposed and seconded that they be accepted and this was agreed by those members present. Bob Humphrey-Taylor confirmed that the standing committee comprising himself (Chair. ), Ian Davies (Hon Secretary), James Edleston (Membership Secretary), Adam Stevens (Hon Treasurer), Cynthia Garlick, Ian Heaps, Janet Jackson, Guy Marsh, Ilona Morgan, and Tim Lowe offered to continue in their current roles. There had been no offers of others wishing to serve on the committee. P Forbes and A Davies proposed and seconded that the standing committee be accepted for a further term and this was agreed by those present. No business had been brought forward by the committee. No other business had been notified to the Hon Secretary. Bob Humphrey-Taylor then closed the formal section of the AGM inviting attendees to refreshments and introducing Tim Lowe who would conduct the Great Mellor Quiz. This inaugural event attracted over fifty people competing in ten teams testing their knowledge about Mellor and the surrounding area. Quiz Master Tim Lowe had devised some 50 questions including pictures of local celebrities past and present into an interesting and enjoyable addition to our AGM evening. The wining team of “Mellor Marchers” comprising William Wragg, Annette Finnie, Anne and Andrew McClelland were presented with a bottle of wine and other goodies. They were also presented with The Great Mellor Quiz Trophy to hold in their safe custody until next years quiz. The trophy is itself a piece of Mellor history crafted from a salvaged brick from Mellor (Oldknow’s) Mill suitably mounted and inscribed. Quiz team entry fees were collected on the night and donated to the Mellor March Fund in support of local cancer charities. The “Friends of Mill Brow” are keen to collect as much information as possible relating to the history and past social landscape of Mill Brow. If anyone has any old photos or other documents it would be much appreciated if they could share them with the Mill Brow group. Until such time as a champion for this Mill Brow history initiative is up and running please forward any information to Ian Heaps at Pear Tree Farm Mill Brow. We’d like to remind all in Mellor that the Parish Centre, located in stunning surroundings at the top of Church Road ( turn left by the Devonshire Pub), is there not only for Church members, but for everyone in the community. It is used extensively on a regular basis by classes in yoga, exercise and karate, by Guides and Brownies, by art and textile groups, toddler group, twins club, and by the WI, as well as for a great variety of evening events, such as talks, demonstrations and concerts. It is available to hire for conferences, exhibitions and weddings. The building is modern, light and well equipped, and the beautiful surroundings and views are a wonderful bonus for any event. Have a look at the Parish Centre website for more information and photos, or phone the PC office on 0161 484 5079. The upkeep of the Centre is of course expensive. The Friends of Mellor Parish Centre group exists to raise money for just this purpose. Every penny that we make from subscriptions and our events goes towards maintaining the Centre to its present high standard for the enjoyment of all who use it. During the past year or so we have put on talks on Garden Birds, and on Antiques; a song recital, a concert of chamber music, an opera evening; an Italian evening complete with home-cooked Italian food; the annual Christmas concert with local artists Tom and Jennifer Lowe and the Community Choir; the 4th Textile Journeys day; a wine-tasting; a quiz and hotpot evening, and several Bridge Drives. At many of our events delicious home-baked food is served by an army of volunteers. Among the events you can expect from the Autumn onwards are a Brass Band Concert in the Fields, a presentation by Bob Humphrey-Taylor as Samuel Oldknow, ‘Figgy Pudding’…a Christmas evening of music and readings, Bridge Drives ,an evening of poetry and cartoons by Ian McMillan and Tony Husband, and the Great Mellor Bake-Off. All details later. We hope to see you at one or more of these events. The subscription is at present, as it has been for the past 11 years, just £5. From January 2015 we are making a much-needed increase to £10 for the year, a small enough amount to contribute to the upkeep of an invaluable community facility. You can also join us by contacting Chris Walters on 0161 430 6714 or at chriswalters60@ntlworld.com, or picking up a form online or from the Parish Centre itself. Friends receive priority booking for all our events, a regular newsletter and perhaps most important, the satisfaction of giving essential support to our wonderful community venue. It is distressing to advise you that several of our members/residents have during the past few months become the victims of burglaries. Police support officers have visited neighbours offering advice on how to minimise the risk of opportunist crime. Despite increasing cuts in services SMBC has responded during the past 12 months to our requests for actions regarding maintaining our green spaces, roads and drainage etc. However, some resident’s hedges and trees are obstructing footpaths. If this situation relates to your property we have been asked to request that you trim your hedges and improve access for road users. Mellor Community Choir is planning an exciting venture for which it is seeking to expand its membership. The choir is for ladies only and although the ability to read music is desirable it is not essential. Are you a competent soprano or alto ? If so, you may be interested in our trip to London to sing in the Royal Albert Hall. The event is the Festival of Brass and Voices on 14th November 2015. This massed choral event takes place every three years to raise money for Cancer Research UK. Rehearsals will be in short bursts starting in September but commitment to the project is needed asap. The experience of working down at Mellor Mill continues to amaze me. We have now worked out that not only was the mill the first of the large scale cotton spinning mills, not only had the largest high breast shot water wheel, not only had the first horizontal steam engines but also an anti-ballooning ring for the ring spinning machine was invented by the mill manager and his spinning master, Edwin Furniss and Mr Young. There may be more to follow as the mill gives up some of its secrets. Edwin Furniss, after the disastrous fire at the mill in November 1892, found himself out of work but came up with the ‘Romantic’ notion of turning the southernmost mill pond into a leisure destination. Re-naming the lake Roman Lakes and the packhorse bridge beyond to Roman Bridge he created a Victorian Leisure Park. The railway had now arrived in Marple and the good folk from Stockport and Manchester came to the Roman Lakes in their hundreds to enjoy the country air, take picnics, row on the Lake (mill pond), play the penny arcade (examples of which are still on display at the tea rooms), listen to brass bands and promenade. The visitors would also trip the light fantastic at the regular tea dances which have recently been re-introduced on the last Saturday of each month. Now, with the help of an HLF grant, we are further enhancing this ‘little gem on our doorstep’ by revealing the remains of Mellor Mill and presenting it for public enjoyment and education as a small country park with an industrial heritage theme. Did you know that Mellor in 1790 had three times the population of Marple? With the building of Mellor Mill Marple grew to support the large workforce and other local industries as they developed. This year the Society is promoting The Great Mellor Quiz to be held in conjunction with the AGM. The business of the Society comprising approval of previous minutes, reports, subscription rate, accounts and election of officers, together with the consideration of any business brought forward by the committee or membership will be dealt with followed by the quiz. If any member wishes to bring forward any business please contact The Chair or Hon Secretary before the end of February. The event will be held at Mellor Primary School commencing at 7:00 pm on Thursday 27th March 2014. We hope that this programme will provide a more interesting and enjoyable evening to those attending as well as increasing knowledge of our village and local area. Some teams, based on church groups and some local pubs, have already signed up to the event. So please get together with your friends and neighbours and enter a team (of up to 6 people). Each team is charged £5 to enter with all the proceeds going to the Mellor March supporting cancer charities. Entry forms are available from Tim Lowe, 0161 499 5935. Shed Security – What you can do? From Safer Stockport Community Messaging. Your home may be very secure, but what about your shed? Think about the expensive equipment you keep in your sheds and garages. Why make it easy for the thief? Burglary of garden sheds is on the increase, particularly in the Heaton’s. Any valuable electrical items should be kept in the home. However, there are some practical steps you can take to secure your shed and its contents. Good rear garden fence or hedges coupled with a lockable side gate will help protect your shed. Prevent thieves hopping from garden to garden by planting prickly plants next to the fence. Don’t forget the benefit of exterior lighting. This can be a simple switch system operated from your house to illuminate your garden area. Passive infra-red lighting is now a popular and inexpensive option to consider. These lights come on automatically when someone is detected by the sensor. Thieves don’t like to be seen! A good quality hasp and staple with a padlock is essential. Remember to choose a hasp and staple that is bolted to the door and frame for extra strength. Use special screw heads that secure the hinges to your shed doors, or smear glue on the screw heads. This will prevent them being unscrewed. Having secured your doors don’t forget the windows, perhaps the best way of securing the windows is to fit internal grilles or bars. To make your property identifiable and less attractive to the thief use an ultra violet pen to mark items with your postcode followed by your house number. Ultra Violet pens can be bought from good DIY stores. Alternatively you can use paint to mark your lawn mower, garden tools etc. A thief will not be able to sell your property if it’s easily identifiable. What’s The Benefit Of Property Marking? If the Police recover your property we know who to return it to. It also helps to secure a conviction if we arrest someone in possession of marked items. Always lock cycles to something fixed or bulky whilst in the shed or garage (ladders or workbench). Have them security marked and registered. Don’t leave any tools outside in the garden which may assist a burglar in breaking into your home. Ladders should always be secured. There are now simple and inexpensive alarms available for use in sheds and garages. By using such an alarm you will be alerted if anyone enters your shed so will your neighbours. “Your garden is for you to enjoy, not the thief. Let’s keep it that way”! A collection of photographs taken around Mellor capturing the beauty and spirit of a wonderful village. Let the images take you on an emotional journey through the year. Sold in aid of The Children’s Society, the charity being supported by Rebecca, the Mellor Rose Queen for 2013-14 her special year. This year sees the 20th anniversary of the Mellor March which has now donated over £150,000 to cancer charities. The aim this year is to try to raise £20,000 to celebrate the anniversary. The March takes place on Sunday 4th May and if you have never yet joined the March do make a special effort this year. It is a circular ten mile walk with stunning scenery with people able to turn for home at many points if the ten miles is too long. It raises money by sponsorship and donations as well as corporate backing. Many other events are linked to the March – marathon runs and walks, birthday parties etc. This year the first Mellor March Lantern Walk was held just before Christmas. Torch carrying walkers were sent off from the Royal Oak by a brass band, enjoyed carols sung by Mellor School Choir in the churchyard and more carols sung by the Hare and Hounds choir. Slightly wet underfoot but a lovely occasion. The Mellor March somehow captures the spirit of Mellor. As we move towards a time of commemoration of the Great War Mellor Primary school is keen to develop a special project to remember the men who fell in WW1. Mr. Nicholson has already met with members of the Friends of the Memorial Garden and some ideas were presented and discussed. Since that meeting further ideas have developed. 1. The children will develop a book to publish about the men who fought and died from the Mellor area. 2. A named plaque for each man lost in the Great War to be designed and place at their relevant Mellor home (with permission of the present owners of course). We will need a ceramics expert to undertake the work. 3. The children will research the men on the memorial using census material and information provided by Anne Hearle and develop a walk trail/map of where the men came from. 4. A special poppy design in the garden is to be developed alongside the Friends of the Memorial Garden. 5. A special piece of art/sculpture to be designed and presented to the memorial garden by the children of Mellor Primary school. 6. In 1920 a special service was held to open the memorial garden – we could repeat the service with songs, prayers and tributes. Mr. Nicholson is presently gathering information to put together a funding bid to English Heritage to enable the work above to be undertaken. Any suggestions and offers of help in aspects of the ideas would be welcomed. A determined attempt to solve the problem of the road flooding by the Hare and Hounds was made in the month before Christmas. The road was closed while new drains were installed that will hopefully take the water away from the road and eventually into Mill Brook. 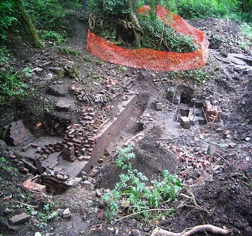 The Heritage Lottery Fund grant of £1.5M has been awarded to joint grantees, Mellor Archaeological Trust and the Canal and Rivers Trust (formerly British Waterways) to carry out the Industrial Heritage project Revealing Oldknow’s Legacy, Mellor Mill and the Peak Forest Canal in Marple. There are now a number of issues to resolve before funds can be drawn down for the project. 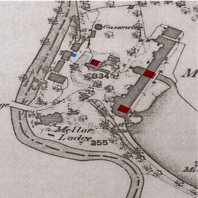 Mellor Archaeological Trust has to establish a 25 year lease from Roman Lakes Leisure Parks Ltd for the Mellor Mill site, the ancillary building by the River Goyt and the site of Mellor Lodge (Samuel Oldknow’s 7 bedroomed mansion). We also have to put in post a full time Project Officer, a part time Archaeological Officer, an Education Officer and a Mill Site Director. Finally there are contractors who we will have to go out to tender for. All this should be in place over the next few weeks so that by Easter the 3 year project will be in full swing. This event will be limited to 30 people. Booking open for Friends January 27th, public booking from February 3rd. Tickets £12.50 from Angela Stead 0161 427 3571. Textile Journeys 4 This all-day event is given by 3 eminent textilers, and features a talk by Elizabeth Wall entitled ‘Ecclesiastical Expectations,’ and workshops given by Elizabeth on ‘Jewelled Fish’ (suitable for beginners), Hannah Leighton Boyce on ‘Mark Making, Writing and Text’, and Alice Hutchinson on ‘Fold, Gather and Stitch’. Tickets are £35, which includes the keynote talk, choice of one workshop and a delicious, homemade buffet lunch. Early booking is essential. Further information and booking forms from Kitty Watt 0161 427 4370 or Rosemary Hawkesley 0161 427 8808. Rubber Bridge Drive 1.30 pm Parish Centre Tickets at £5 per person or £18 per table from Val Wallace 0161 427 4900. Booking opens on March 17th. The Society keeps an eye on current planning applications to ensure that they meet both the legal requirements and aesthetic considerations, remembering that much of Mellor lies within the Green Belt. However, when the Parish Field was sold for building purposes, the plot lay outside the Green Belt, and no objection could be raised on that score. The Society felt that five houses – which the original scheme proposed – were too many, and the number was reduced to four. A recent major concern has been the application to build 21 apartments in three blocks on the site of the disused Cataract Bridge Mill. Accessibility for traffic, potential numbers of cars, height of the buildings and the possibility of overlooking nearby properties are matters which have exercised local residents. The Local Area Committee of SMBC considered the application on 27 October 2004, when both the applicant and one resident were allowed to present their respective cases. We now know that the application has been approved, but the roofline of the apartment blocks has been lowered, and more parking spaces have been provided. However, no development is evident at present. Another matter for concern has been the proposed erection of mobile phone masts in various locations around the village. One application for a mast on Cobden Edge was withdrawn by the landowner, but permission has now been granted for a mast on Low Lea Road. The Society notified residents likely to be affected by the mast, and they were able to attend the planning meeting. Despite their objections, the application was granted. The Society continues to monitor the planning register, and will notify residents of any further such proposals. The setting of the Memorial had become rather shabby, and the Park behind the cross was very neglected. In 2002, the Society suggested alterations in the general layout, and held site meetings with SMBC officials. Work has now started on these improvements to the Park. In addition to the efforts of the local authority, the Society has organised several working parties of Mellor residents to assist in the re-planting of the flower beds. The Society funded the purchase of plants and seeds for this task, and now the park has taken on an entirely new look. It is well worth a visit! Now the Society has been awarded a grant to fund the purchase of two benches (which have been installed), and there are hopes that a further grant for the purchase of more plants may be in the offing. These activities have led to the formation of a sub-group of the Mellor Society: Friends of Mellor Parks, which will keep a watch on the management of both the Memorial Park and the Recreation Ground. A questionnaire is to be circulated asking residents what play equipment they would like to see on the Rec, especially for older children. There are many problems associated with the roads in Mellor – potholes, parking, speeding, flooding, lighting . . . the list goes on and on! The Society is active in drawing the attention of Stockport MBC to these matters, and has had some recent successes. A current concern is the speed of a few drivers on Longhurst Lane, and a temporary speed warning camera was set up and the data recorded. Some years ago, an economy drive forced the closure of several public toilets in our area, including the ones adjoining the Recreation Ground. Bearing in mind the great number of walkers who frequent the local footpaths, and the need for such a facility near to a children’s play area, the closure caused the Society great concern. Continual pressure was placed on the Council to reinstate the toilets, and the toilets were officially opened on Thursday 5 December 2002. Two planters have now been purchased by the Society, and these have been installed near the toilets. To celebrate the Millennium, three oak saplings and thousands of daffodils were planted on the Recreation Ground. Two of the oaks did not survive, but have now been replaced, and the daffodils appear in greater numbers every spring. The public notice board on the Recreation Ground was badly sited, and the Society has been successful in having it moved to a position where it can be read more easily.